During the course of the year I escape to various places within the house and property to become recluse and meditate. Beginning in September it is my wood shop. In April it is my garden. Both have a soothing effect on my brain and relieve my inner stresses. 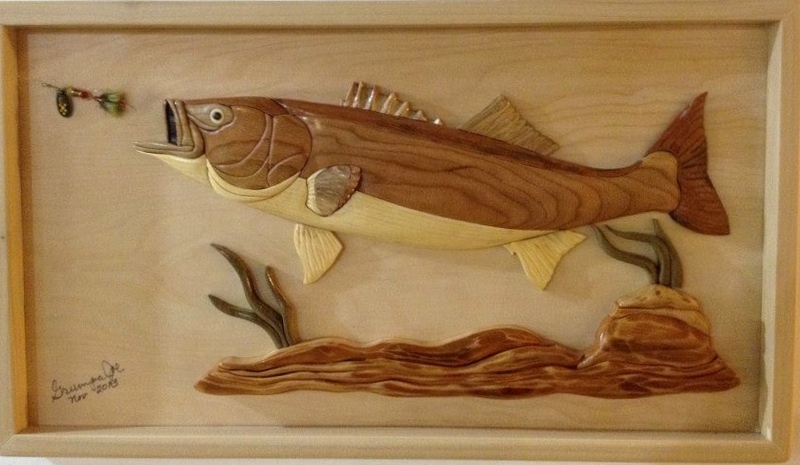 This season in the wood shop I managed to eke out five intarsia projects of which I am proud. The next project involves the Lions Club. It is outside the home and will probably add to the stress rather than to relieve it. Tomorrow my club begins vision screening children to identify potential eye problems. I’ve been practicing with the instrument which is a camera and computer rolled into one. So far, all I have managed is to get error codes. It seems the device does not work well on adults. Hopefully, tomorrow I will get good results on actual kids. In the meantime, here are some photos of my winter projects. Several have been displayed on my blog before, but there are new ones in this album. It is hard to get back in the groove of writing something everyday. Frankly, I suffer from writer’s block today. It amazes me as to how long it took me to develop a daily writing habit, and how little time it took to lose it. The best way to overcome the block is to talk about the day. I spent a few hours in the garden wood shop today grinding wood into what I hope will look like a flower. This is the fourth project I am undertaking this fall. In previous years I settled on a single design and concentrated on making multiples so I could use them as Christmas gifts. I want to use them as gifts this year too, but each one has been hung on a wall within our humble domicile for the purpose of giving Peg and I great pleasure. Sorry, friends, no Intarsia gifts this year. 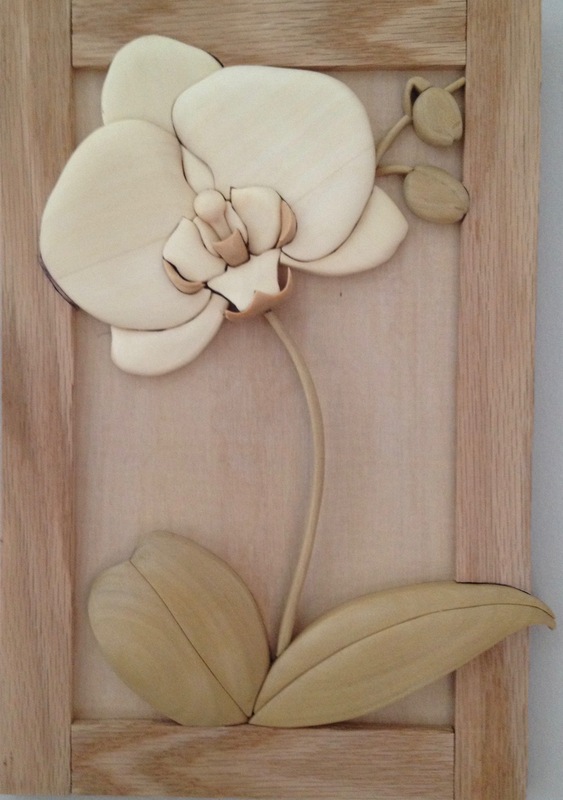 Each flower is different, and I have come to believe that these wooden flowers are a substitute for my nonexistent 2015 Monet Vision. Let me just say, I had the vision but did not have the energy to make it materialize. Perhaps the 2015 will morph into the 2016. Physically, and emotionally I am all done in. Life has dealt me a hand which ten years ago I could only imagine, but never thought it would come. Age has crept into the mix, and my role has evolved from friend, lover, husband, to full time care giver. Some days are easier than others. People keep telling me to get help, but I am not smart enough to be able to know what it is I need in the way of assistance. I’m sure I’ll figure it out as we proceed along our current path. In the meantime, at every chance I get, I abscond to the lower level to cut, grind, sand, and shape until I form a flower from wood. The activity takes my mind off of any problem that may have developed, and it releases the creative urge in me to make something nice. Calla Lily at the six hour mark. A year ago I got the bug to make some Christmas gifts. 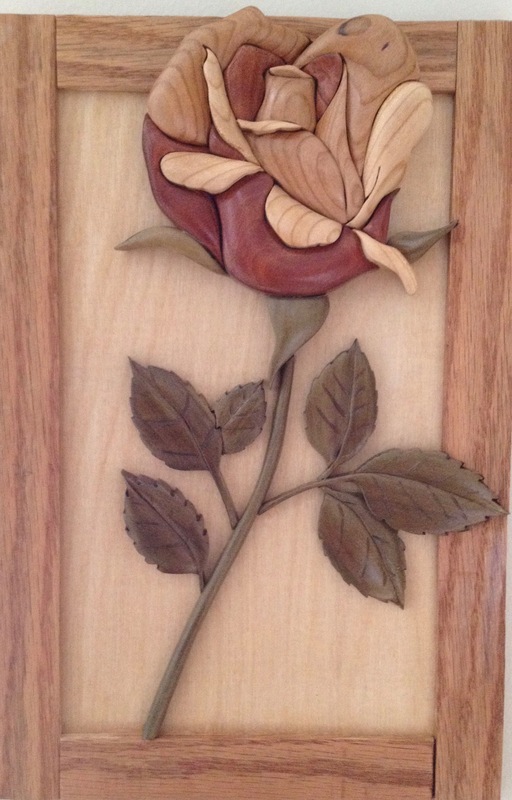 I began a project in late November to make twelve Intarsia flowers for the women in the family. I struggled to complete five in time. The project over whelmed me. This year, I began making gifts in September thinking it would be enough time. Except, the people I made gifts for had aged and I no longer felt comfortable making teddy bears for my grand kids. When I began Intarsia, my oldest grandchild was four. Today that same child is nineteen. 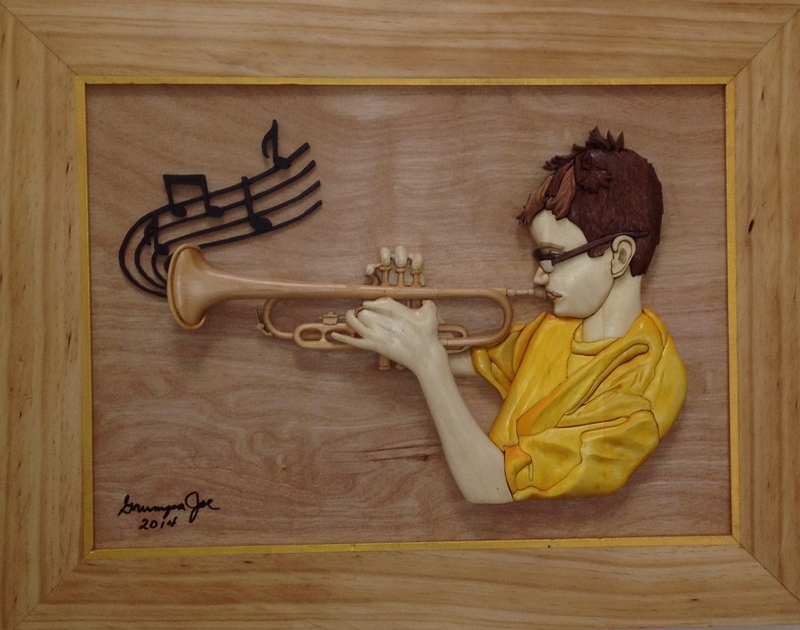 When it all started as a hobby, I set a goal to make an intarsia piece for each grandchild. I managed to give my first three kids a hand-made intarsia art piece. Then there was a lull in grandchild production. By the time new kids were born my life had changed dramatically. Four more kids came. Dan was a toddler when my wife Barb had her heart attack, and my drive to make intarsia art faded to zero. Barb died, and three more kids came during my grief. I lost the idea, until last summer when I realized my life calendar is running down. The idea of making Dan a teddy bear didn’t compute because he is thirteen now. The same went for the rest of the kids, they are eight and ten. I took care of my ten-year old grand-daughter last year with a flower. The two youngest are brothers and are avid fisherman, each got an intarsia fish, Brad got a largemouth bass, his brother Ben a stripped bass. So that left me with Dan. 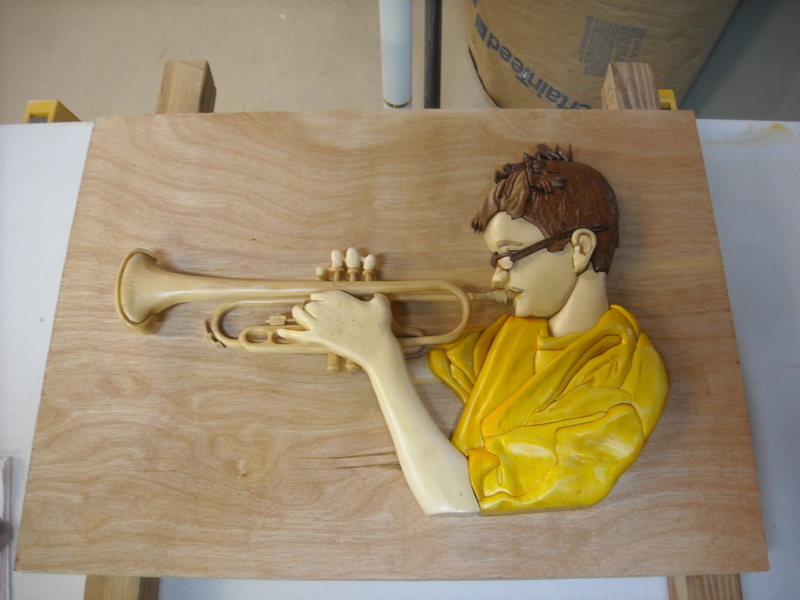 Most Intarsia wood workers are craftsmen not artists. They make the art from pre-designed patterns. I did this for the flower and the two fish. I bought pre-designed patterns and made the art-piece as a craftsman. I decided to design the last work from scratch. I had made enough art-pieces to feel comfortable with the art form and needed to jack up my experience a level. I thought long and hard about what kind of piece to make for Dan. He is not a fisherman like his cousins, he is a swimmer, and a very good one. 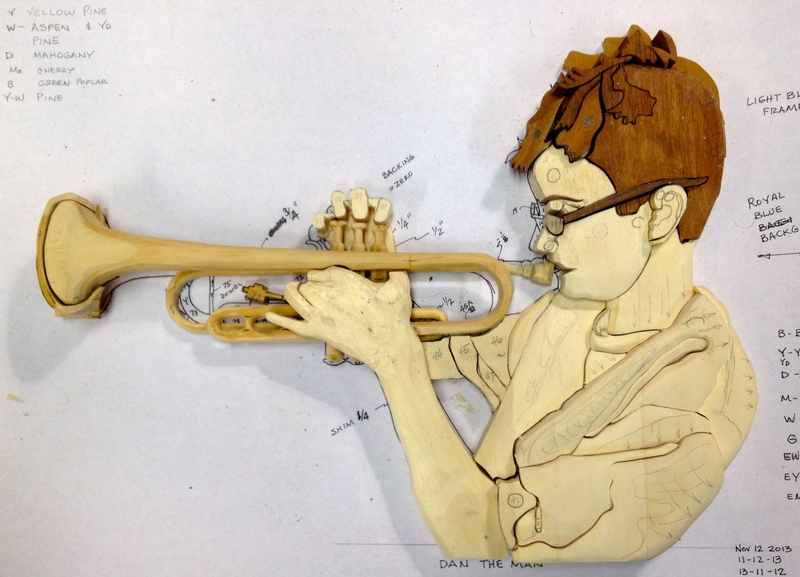 I couldn’t imagine how to design a piece of art made from wood to depict swimming. 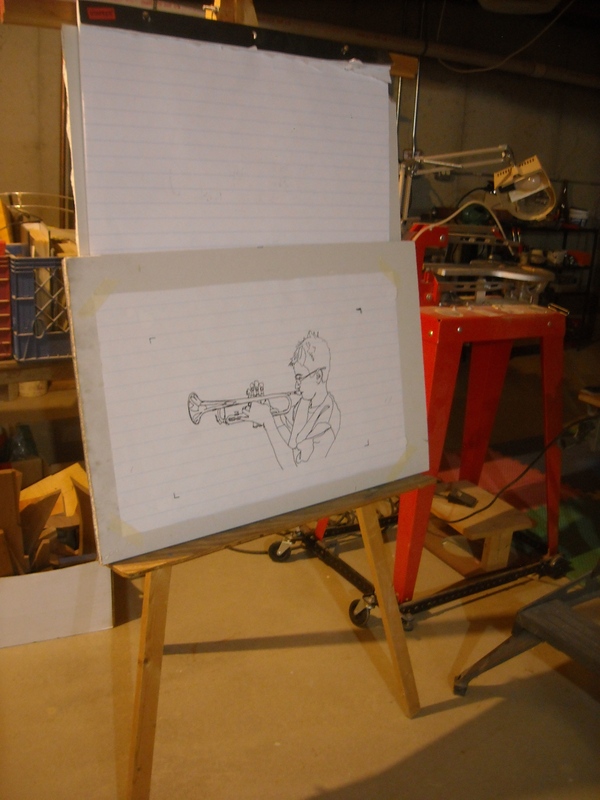 I am not creative enough, but I did vision him playing his trumpet. I called his father and asked him to photograph Dan while he practiced. I received two photos and chose one to work with. At first, the project excited me, then fear took over. I froze with the fear of actually designing a piece and executing it. For two months, I could only think about how complicated a work I had decided to take on. 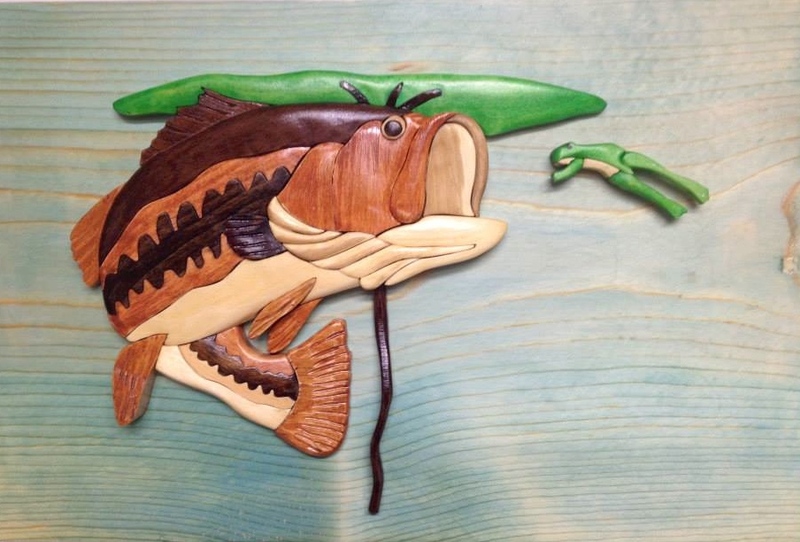 I procrastinated by making the two fish ahead of the one I designed. My design would be the reward for completing two projects ahead of time. 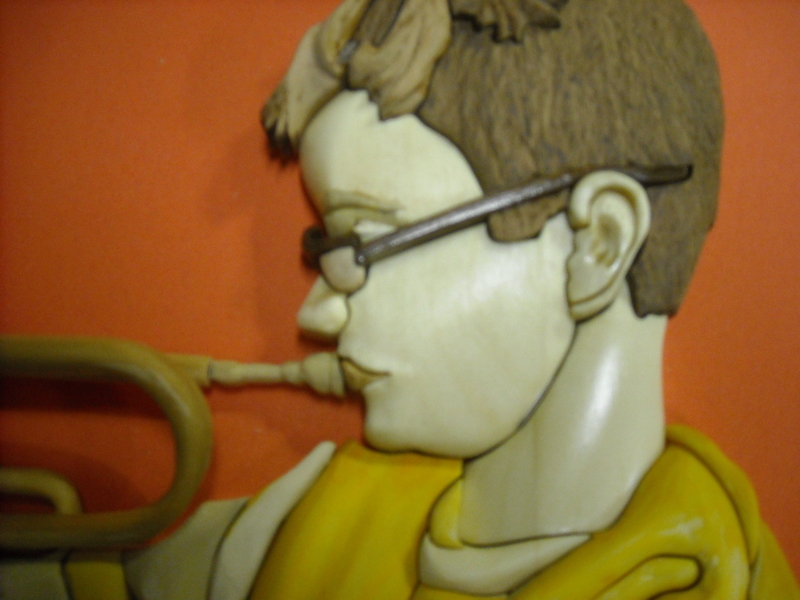 By the time I got started on the Horn Man it was November which is a short month in the wood shop because of Thanksgiving and Christmas decorations. I finally began with my grand-daughter who helped me transfer the photo into a line drawing. Once I had the line drawing it took a couple of days to decide where the cut lines would be, which colors of wood I needed, and which direction the grain would run. Actually, this was the easy part since I have spent over forty years in a business which relied on my visualization and transfer of designs into workable drawings. With the baby steps initiated, I began to gain confidence in completing the piece. There were several set-backs along the way. The largest cost me too much time. 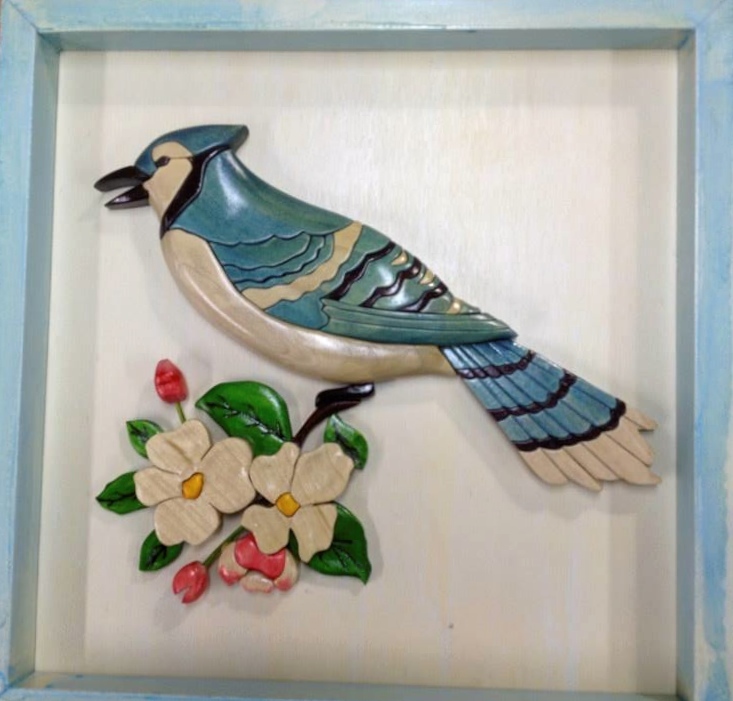 Originally, I decided to make the piece a traditional two-dimensional intarsia piece. There was no way for me to execute a two-dimensional design easily. I needed to shim some parts and to slab cut others to create the third dimension. 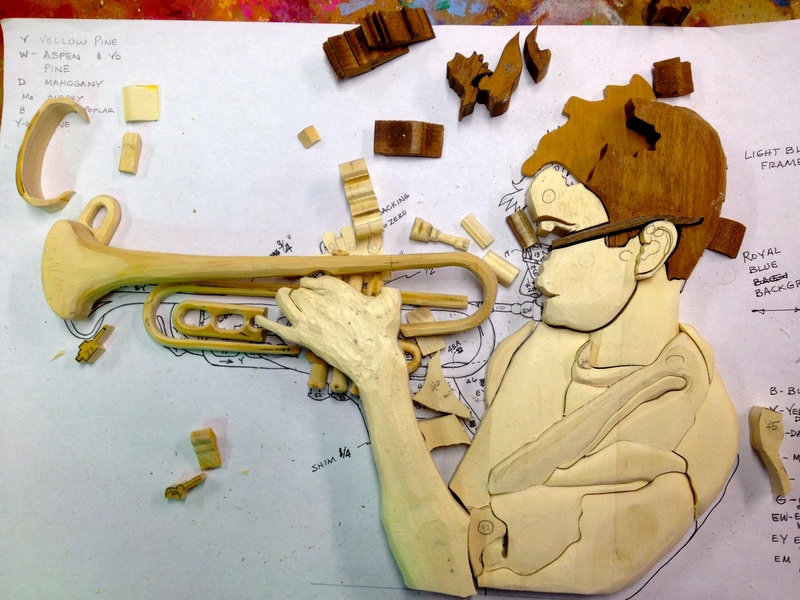 Making the trumpet was one such set-back. 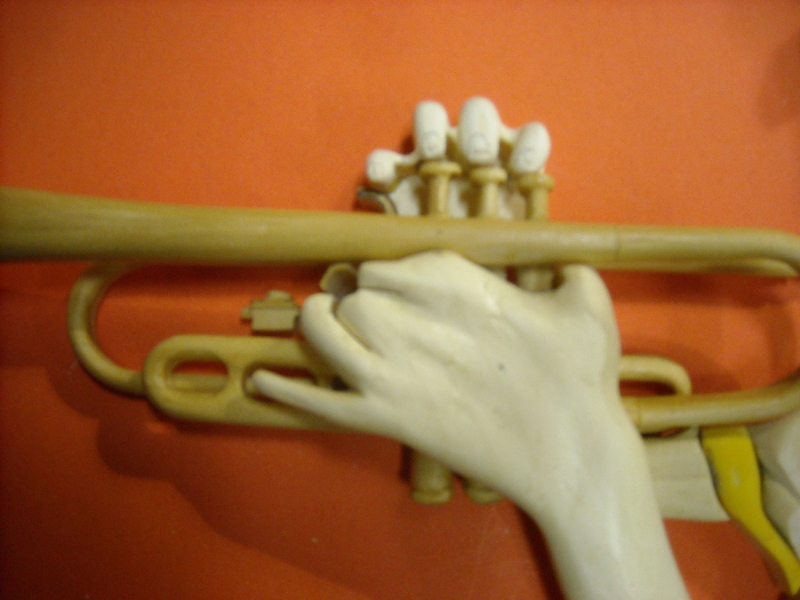 I scrapped what I was doing and chose to make a three-dimensional trumpet, except I didn’t have enough information to make a 3d horn. 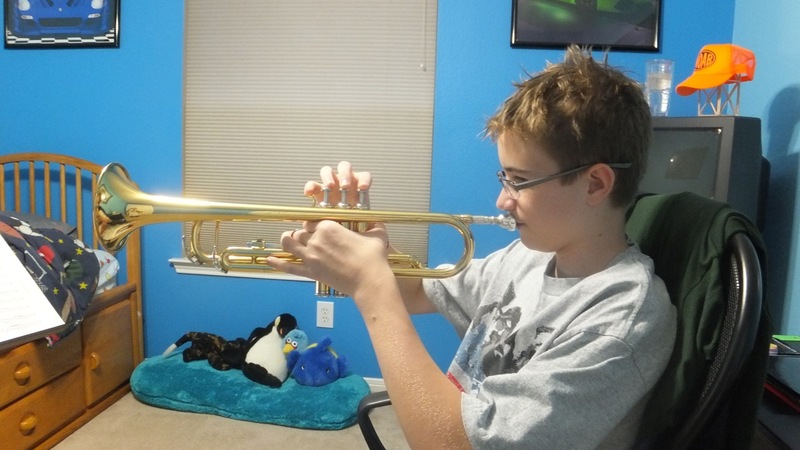 I spent time on the web searching for images of trumpets and printed out several pages of trumpet details to study. It became clear that the Christmas deadline could not be met. Lucky for me that Dan lives in Texas and I was going there in January, so the deadline moved to mid-January. I finished the Horn Man a week before Peg and I were leaving for the West. 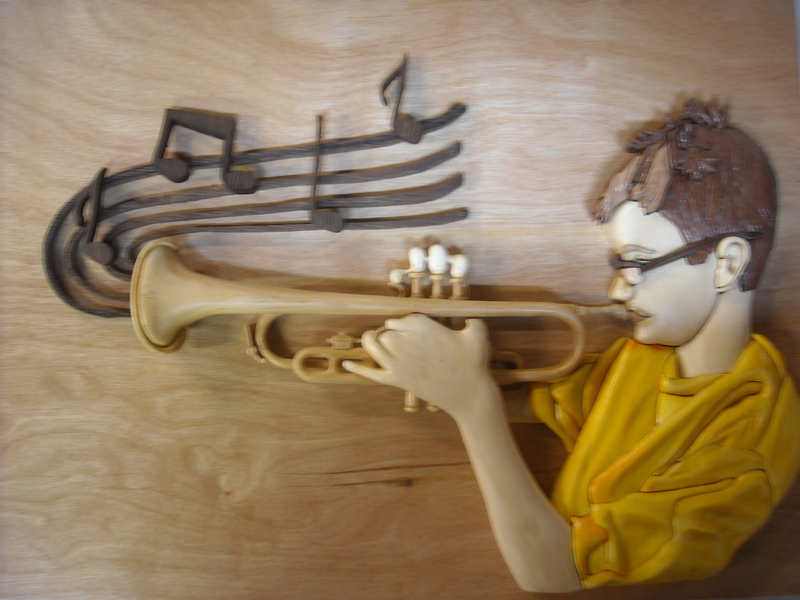 Just before the final glue together, I felt the piece needed something else and I decided to add the musical score. 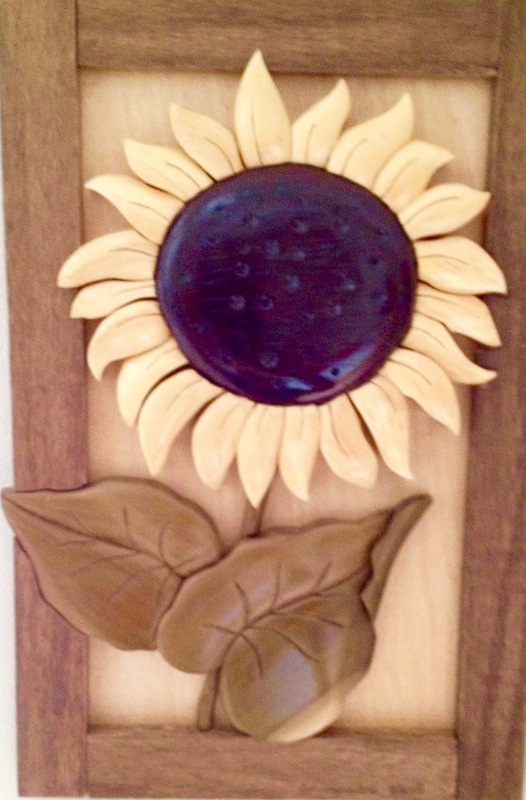 A month earlier I acquired a piece of wood which was perfect for the music, it is so dark it looks black. The wood was a nightmare to cut. It is so dense I wore out many saw blades before I finished the music lines and the notes. Four days later I finished it, then I scrapped it because it overwhelmed the piece with its size. I was now three days away from leaving for Texas. They say necessity is the mother of invention and I redid the music using some very thin plywood that cut super easy enabling me to finish the music in four hours. The end result turned out to my satisfaction. Lots Of Loose Pieces With Some Minor Shaping On Some. What’s A Horn Without Music? Please judge the five Intarsia flowers below and tell me which one you like the best. All five were hand crafted by Grumpa Joe in Santa’s workshop while Santa held Grumpa hostage and worked GJ’s fingers to the bone.